Craftside: "L" is for Lisa Kettell author of Altered Art Circus! "L" is for Lisa Kettell author of Altered Art Circus! Altered Art Circus! takes the reader on a magical journey into an artistic world where you can discover your creative muse, waiting to come out and play. It is, at heart, a technique book for altered artists, but the ideas are housed within a wonderful, spectacular fantasy land. Altered Art Circus! you the daydreamer, the explorer, the artist, to a place you have never been, where you can unleash your artistic dreams and explore hidden worlds through cutting-edge techniques, creative projects, and beautiful images. Altered Art Circus! includes easy tutorials on basic digital altering effects for new and vintage images, step-by-step instruction for projects, a gallery of inspirational work from other artists, and clip art and images for you to use in your own projects. The book covers digital and paper alteration, creating from found and household objects (jars and boxes), features playful illustration, vintage imagery, and uses myriad other mixed-media materials, ranging from glitter and wire to crinoline and coloring agents. My workshop has the feel of an old apothecary shoppe, with black shelving and artful displays. I have a love for vintage bottles and glass, using them when ever I can for my glitter and unique supplies. I save them, they become my best work, most of the time. All the time, from old tomato sauce jars to ribbon spools, recycling into new items is a passion of mine, I love re-inventing. Depends on the mood or the pieces I'm working on. I can listen to acid jazz, the Nutcracker/Classical or Alternative Rock. I have a very diverse musical taste! Anywhere from a half hour to 3 weeks, it all depends on the details and size. In old planting vases, jars, photo boxes, baskets, and a huge Orient Express Trunk. Romantic Homes, Victoria, Southern Lady, Somerset Publications (all of them), Cloth Paper Scissors, Home Companion, Faerie Magazine, Tea, Marie Claire Idees(From France) , Little Things Magazine (From Asia) and my own zines: The Faerie Zine and Piddlestixs! Varied, my style changed all the time, but I am lover of Egyptology/Bombay Old England style with vintage apothecary and I love the Tea Time Shabby Chic look as well, and these can all be seen in the themes of my works. I love paper so I can tell you I try to incorporate paper of some sort into my works and glitter. Again new designs depend on the look I am trying to achieve and supplies will be added throughout the design process as I think of them. Carnival Dolls, Wooden Shoes, Pearls, Eiffel Tower Items, Tea Time Accessories, And Books, Ephemera are on the mind right now, I collect all of these things and more! 13. And the all important question (from Ravelry) what is your favorite swear word? Oh goodness, I've shouted out several of them when I burn my hands on hot glue! Thanks Lisa for sharing all your insights into your creative process and space! Anyone can make cute and cuddly creatures from a handful of fluff and a barbed needle! Needle felting is a new craft and is gaining in popularity. There are only a few books written on the subject and most of those focus on 'flat' needle felting on a surface. 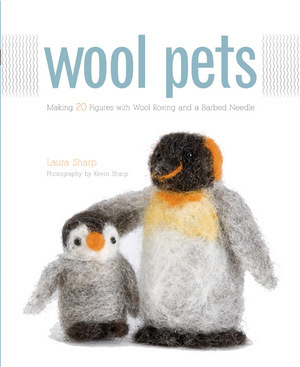 This book is about sculptural needle felting--creating 3-D animals and figures using the felting needle to sculpt wool. This book shows the techniques and describes how the felting needle works with wool fiber to create felt, while explaining the differences between this art form and other forms of felting. You will learn how to hold the needle, what sort of materials to use, and why. There are 20 complete projects including various birds, bugs, four-legged animals, and people--each one unique and irresistible! Laurie also shows the reader ways to display their felted creations as mobiles, ornaments, or arranged in shadow boxes. Laurie Sharp is a full time artist and has been needle felting for over 5 years. She raises her own sheep, shears and processes the wool for most of her projects. She has been featured on HGTV’s 'That’s Clever'. View her web site: www.woolpets.com. Her work has been shown in a number of galleries in the Pacific Northwest, where she lives with her husband and business partner, Kevin Sharp. Kevin is a professional photographer, and provides both beauty and how-to photography for this book. His work can be viewed on www.sharpphotography.com. 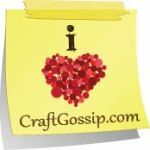 What are you going to be crafting up for spring? If you celebrate Easter, have you picked your theme? Eggs were definitely my theme last year, but I have already gone full on bunny this year. Especially the Peeps bunny. And as usual, leave your answer in the comments section and you'll be entered to win a free book for peeps sake! I was gifted dozens of plain white Chinese takeout cartons. I'm going to decorate them with a spring theme and fill with Easter eggs to give to friends. Oooh! I wanna be one of Janet's friends. I haven't thought so much about crafting for Spring. However, I have been giving serious thought to this "spring cleaning" phenomenon I've heard tales about... Does that count? Thanks for the info on those 2 books. They are both crafts that I really want to try. For Easter I will probably knit some little easter bags or baskets but as I am going into winter not spring (I come from a land downunder) my thoughts for crafting are more towards some felted scarfs. I want to try shibori felt with some of them. I just love your Craftside gift of information. Your choices often fit in with the craft work I am doing or want to do. I already have the felting book, but would love the other one Altered Art Circus and am going to look up some of the books Stephanie Girard has on her Sweather Surgery. My favorite L word is Lavender. I'm in a swap to make Easter cards, but haven't even started...yikes! Guess I better get busy. I'd love both book...I'm in one of Lisa's groups on Flickr her work is awesome! And I love to needle felt. I'm making Easter Doll Assemblages in Large Candy Easter Egg Containers, with the plexi glass lids, really into preserving peeps by encasing them in resin. Thank You so much for publishing the interview today on your blog! Thank you for sharing that wonderful interview with Lisa - her studio looks magical! For Easter I'm going to try my hand at these wonderful little bird nests and trees that were featured on an oh-so-popular show recently. They were absolutely charming.